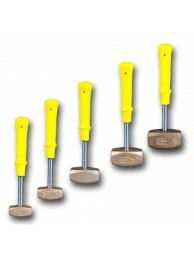 High quality tools, these hammers feature heads cast of solid yellow brass. The same material selected by many machinists in making their own personal hammer just to get the characteristics it affords…good solid impact with the desired softness. The handles are standard, same as above. The handles, consisting of a sturdy steel shank with a contoured safety-grip molded permanently onto it, are extremely durable. The grip, of a cushion synthetic rubber, has a comfortable, no-slip feel when grasped. 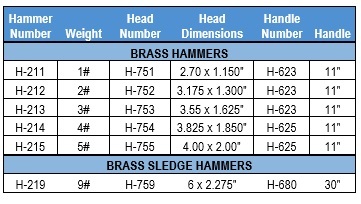 H-211 Brass Head Hammer Most versatile of the line, these hammers offer the best featur..
H-212 Brass Head Hammer Most versatile of the line, these hammers offer the best featur..
H-213 Brass Head Hammer Most versatile of the line, these hammers offer the best featur..
H-214 Brass Head Hammer Most versatile of the line, these hammers offer the best featur..
H-215 Brass Head Hammer Most versatile of the line, these hammers offer the best featur..
H-219 Brass Head Sledge Hammer Most versatile of the line, these hammers offer the best..